Bothwell, J. (1 November 1997). 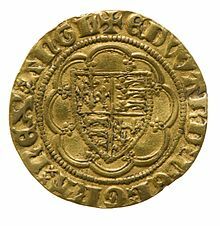 "Edward III and the 'New Nobility': Largesse and Limitation in Fourteenth-Century England". The English Historical Review. 112 (449): 1111–1140. doi:10.1093/ehr/CXII.449.1111. JSTOR 577101. Bothwell, J. (2008). 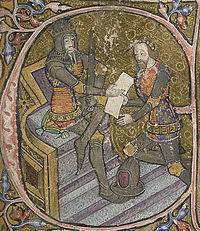 "The more things change: Isabella and Mortimer, Edward III and the painful delay of a royal majority". In Beem Charles (ed.). 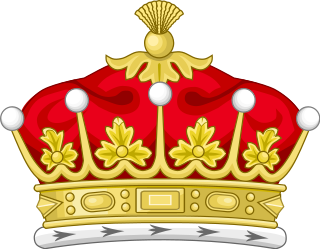 The Royal Minorities of Medieval and Early Modern England. New York: Palgrave Macmillan. pp. 67–102. ISBN 0-230-60866-3. Fryde, E. B. (1 July 1983). Studies in Medieval Trade and Finance. London: Hambledon Press. ISBN 978-0-907628-10-1. McKisack, M. (31 December 1959). The Fourteenth Century 1307–1399. Oxford History of England. 5. Oxford: Clarendon Press. ISBN 978-0-19-821712-1. Morgan, D.A.L. (1 September 1997). 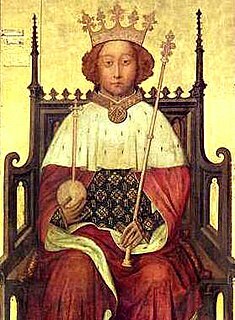 "The Political After-Life of Edward III: The Apotheosis of a Warmonger". The English Historical Review. 112 (448): 856–81. doi:10.1093/EHR/CXII.448.856. JSTOR 576696. Ormrod, Mark (1986). "The English government and the Black Death of 1348–49". In Mark Ormrod (ed.). England in the Fourteenth Century. Woodbridge: Boydell. pp. 175–88. ISBN 0-85115-448-4. Ormrod, W.M. (1994). "England, Normandy and the beginnings of the hundred years war, 1259–1360". In Bates, David; Curry Anne (eds.). 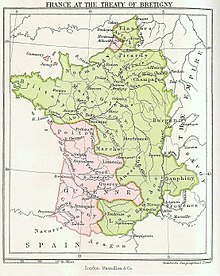 England and Normandy in the Middle Ages. London: Hambledon. pp. 197–213. ISBN 978-1-85285-083-8. Retrieved 30 April 2011. Ormrod, W.M. (3 January 2008). 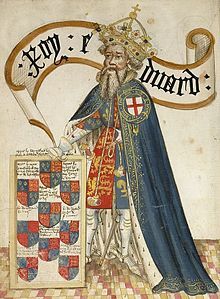 "Edward III (1312–1377)". Oxford Dictionary of National Biography (online). Oxford University Press. doi:10.1093/ref:odnb/8519. Verduyn, Anthony (1 October 1993). "The Politics of Law and Order during the Early Years of Edward III". The English Historical Review. 108 (429): 842–867. doi:10.1093/ehr/CVIII.CCCCXXIX.842. JSTOR 575533. 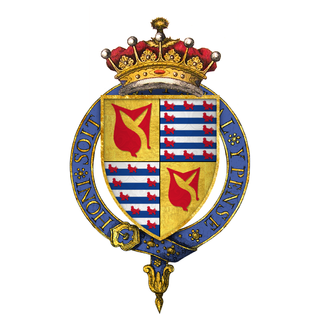 William Montagu, alias de Montacute, 1st Earl of Salisbury, 3rd Baron Montagu, King of Mann was an English nobleman and loyal servant of King Edward III. 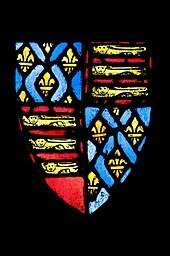 John de Vere, 7th Earl of Oxford was the nephew and heir of Robert de Vere, 6th Earl of Oxford who succeeded as Earl of Oxford in 1331, after his uncle died without issue.